Shirts With Random Triangles: Miami Head Coach Mark Richt Tweets Out Congratulations To Former Team Georgia On Its 2016 TaxSlayer Bowl Win. Miami Head Coach Mark Richt Tweets Out Congratulations To Former Team Georgia On Its 2016 TaxSlayer Bowl Win. 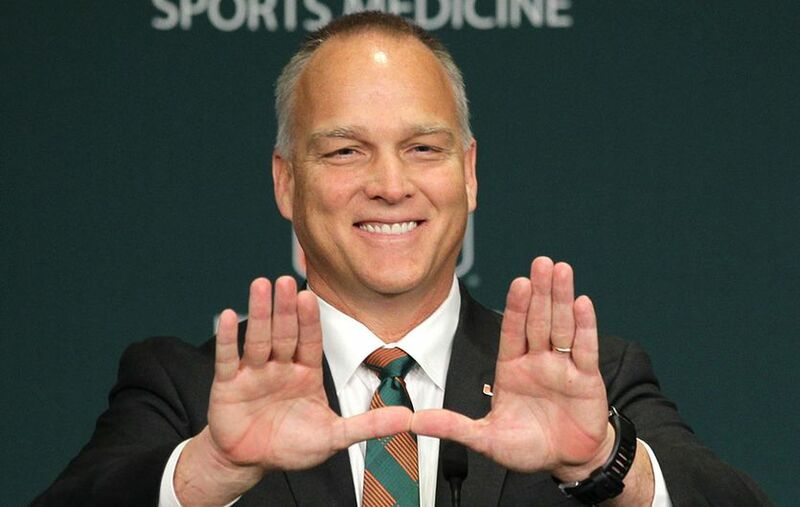 Mark Richt making "The U." (This still looks awkward.) Image via ajc.com. Mark Richt took some time out from getting settled in his new job as head coach of Miami to congratulate the team he formerly coached, the Georgia Bulldogs, on its 24-17 win over Penn State in the 2016 TaxSlayer Bowl. Richt shared his congratulations to the Dawgs via Twitter. Congratulations to the Georgia Bulldog coaches and players! Great to see the senior class reach 40 wins! God Bless! Richt served 15 seasons as head coach for Georgia before being fired on Nov. 29. 2015. He had a record of 144-51 at UGA, with a 9-5 bowl record. He was hired as head coach of his alma mater, Miami, on Dec. 2, 2015.